Custom 25mm Easter Name Badge. 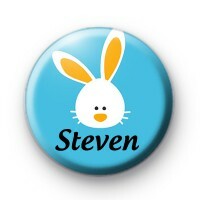 Bright blue badge with a white Easter bunny & space for you to add a custom name. Ideal for kids Easter Parties and School Events. If you are planning an Easter Egg Hunt/Easter Party this year why not use our badges as keepsakes/party favours. We have lots of lovely, bright and fun Easter designs to pick from. Including everyones favourute, Easter Bunny badges, Easter Egg designs and quite a few yellow Easter chicks options too. Make sure you take a look at our Easter Badge category down the left-hand side before checking out. All our badges are proudly handmade by us in the UK and all our badges are 25mm in size.